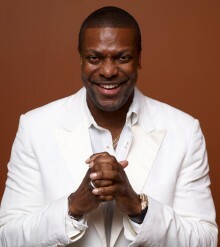 There is nothing tranquil about comedian/actor Chris Tucker. A limber, wiry fellow with a high-pitched voice and a delivery as fast as a mosquito’s wing beats, he seems energy incarnate. In regard to his acting, some have hailed him the next Eddie Murphy; indeed, Murphy was one of Tucker’s icons while growing up. A native of Atlanta, GA, Tucker’s proclivity for comedy has been lifelong, beginning when he, the youngest of six children, used humor as an attention-getting device and as a way to get his brothers to allow him to hang around them. In addition to Eddie Murphy’s comedy, Tucker was heavily influenced by that of Richard Pryor. In high school, Tucker was one of those class clowns who was able to make even his teachers laugh and it was one of his instructors who suggested Tucker display his gifts in a school talent show. He proved a roaring success and following graduation, decided to become a professional. His classmates, having voted him “Most Humorous,” supported his efforts. Tucker made his debut at a local comedy club. Because he was underage, Tucker had to sneak in and then do some real fast talking to be allowed to perform. He succeeded and his routine garnered a tremendous response. More local successes followed and this emboldened the then 19-year-old Tucker to try his luck in Los Angeles. Soon after arriving on the West Coast, Tucker had established himself in the major comedy clubs and, after appearing on HBO’s Def Comedy Jam found himself a bona fide rising star. Tucker made his film debut with a small but memorable role in House Party 3 (1994). The following year, Tucker appeared in F. Gary Gray’s crazy comedy Friday, playing Smokey, a lazy pot-smoking drug dealer who could be quite rich if only he’d stop using the merchandise himself. Tucker’s hilarious improvisation during filming helped to make the film a sleeper hit. In his next film, Dead Presidents, directed by brothers Allen Hughes and Albert Hughes, Tucker hinted at some real talent as a dramatic actor. In regard to movies, 1997 proved a very good year for Tucker who was given his first showcase film in the action comedy Money Talks, which he executively produced. He also had a small but memorable role in Quentin Tarantino’s Jackie Brown and played a hyper-manic intergalactic DJ in Luc Besson’s The Fifth Element. In 1998, Tucker had his second starring role, working opposite international action superstar Jackie Chan in the action-packed comedy Rush Hour. While his movie career continues its rapid ascent, Tucker remains passionate about performing live and still appears in comedy clubs and other venues. Do you want to hire Chris Tucker? Directly request a quote. In 48 hours we can send you the availability of Chris Tucker If you would like to book Chris Tucker, Entertainment Booking Agency is the right place. We will offer you the best price and contact the management or we directly contact Chris Tucker. For corporate appearances or speaking engagements you can contact our agents and the will help you true the process. Tags: hire Chris Tucker, Chris Tucker booking, book Chris Tucker, Chris Tucker appearances, find more information on booking Chris Tucker for appearances, Chris Tucker speaking engagements, Chris Tucker endorsements/spokesperson, Chris Tucker appearance fees, Chris Tucker booking agency contact info, biography of Chris Tucker, Contact an artist booking talent agent find a speakers bureau that can book Chris Tucker, speaker booking agency for Chris Tucker, Chris Tucker booking agency, Chris Tucker booking for corporate event. EBA is one of the biggest entertainment booking agencies in the World. We book hundreds of celebrities, artist, athletes and speakers in a year. Important to know is that we are not claiming to be the management of Chris Tucker. We are not the official agent for Chris Tucker. Companies from around the globe book these artists and speakers true our company be course we have one of the biggest networks and we always have direct contact with the artist or the management. We help you to find the right celebrities for your corporate of private events. Please contact one of our agents to get free advice and we will help to get the world-famous artist on your party.